Looking for a way to be a D•I•V•A•S? The Bible study, developed by Donna McCrary and Sherri Holbert, focuses on a strategic plan that women can follow to improve their spiritual walk. Ultimately, through prayer, accountability - hence the name: Devoted Individuals Via Accountability & Prayer - the study is designed to help women gain a confident outlook on achieving life aspiration. The eight week study - which comes in a workbook form - includes information about developing an intimate prayer time, accountability, weekly devotions and group challenges. 1. A Great Bra! (Prayer Foundation) – Even though many women don’t enjoy wearing this undergarment, it is the most critical aspect of any DIVA’S outfit! Why? It is the foundation—just like a relationship with God that offers support and is always uplifting. 2. Mirror (Real Beauty) – A DIVA looks into the mirror to check hair and lipstick but more importantly to make sure what she sees is real—to make sure her beauty is reflected from within, transparent and authentic. 3. 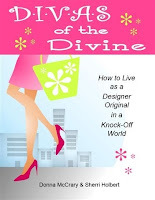 Shoes (God’s Purpose) – The perfect designer shoes guide her daily walk with Christ. Must fit her style as an individual and accentuate the relationship that is uniquely hers in order to make every step count. Little steps help her go the distance. 4. Sunglasses (Priorities) – Oh, how important to filter the harmful rays and the worldly view of the sunlight so she is only exposed to the pure Son and all of His benefits! 5. Chocolate (Time Out) – Every DIVA’S little piece of heaven! It may be small but it’s sweetness, it’s creamy comfort, and its AHHHH factor, is enough to sustain her until she gets to experience the wonder of heaven. It’s the little pick-me-up that will remind her to sustain her eternal perspective no matter the circumstance. 6. Wrinkle Cream (Forgiveness) – It is the hottest thing on the market for any DIVA who wants to remove lines and wrinkles. The Spirit-inspired ingredients are key to erasing the fine lines of stress, worry, and bitterness to help her let go of the past. This cream is full of the healing power of forgiveness, grace, and unconditional love. 7. Watch (Commitment) – Every DIVA has a favorite watch. This piece of bling pulls every outfit together. She feels lost when she forgets to wear it. Time! Time requires commitment and every DIVA chooses wisely how she spends it. 8. Girlfriend (Accountability) - The most important necessity for all true DIVAS. She’s caring and fun to be with. She is the “speak the truth in love” kind of friend that will hold the DIVA accountable to being the true Designer Original she was created to be. 10. Lipstick (Positive Words & Attitude) – Positive words and a polished tone flow from her lips in pretty colors and a high-gloss shine. Her words inspire others. From high top basketball shoes to high heels, each step of Donna McCrary’s life has equipped her for a Life Coaching career. She is a challenging facilitator whose “tell it like it is” approach always incorporates a call to action from her participants. McCrary draws from her background as a recreational therapist to create dynamic outcome-oriented keynotes, retreats, and curriculums. Her greatest passion and deepest joy is to “coach” women in realizing God’s plan for their lives and in discovering for themselves the source of genuine joy. 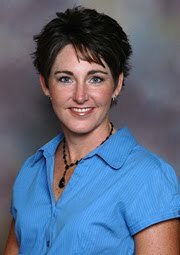 McCrary is a wife, mother of two, and beloved friend. Her hobbies include hiking, vacationing at the beach, and trying projects from popular HGTV home improvement shows... much to her husband’s dismay! Sherri Holbert invested many years with companies such as Biltmore Estate, Chick-fil-A, and Chimney Rock Park in developing new and creative programs to excel these corporations to higher levels of success. Holbert is founder and CEO of Power-Up!, a coaching company whose mission is to take individuals and corporations to the next level of success. She works as a coach, facilitator, and speaker for a variety of clients ranging from corporate executives to stay-at-home moms. Holbert's passion is unlocking the untapped potential within others to help them gain fresh perspectives, develop clear vision, and establish action steps that will make their dreams reality. Holbert is a wife, aunt, and friend to many. She has a self-proclaimed addiction to shoes, purses, and Starbuck’s coffee. One of her life goals is to be on Survivor (her favorite TV reality show!). It's a prize fit for a DIVA! Make sure to leave your e-mail address - so they'll know how to contact you if you win. You must post by midnight CST - Thursday, Sept. 16 to be eligible. Sherri: If life for you is like driving 100 mph in a convertible, make sure you have a map to your dream destination and a friend to keep you focused on the plan so you don’t get sucked into the tourist traps along the way. Don’t be Thelma and Louise! Allow your passion to drive you to the mountain top of success instead of driving you off the cliff with no purpose. try on the new, and then commit to pay the price. More info about the book - here or here. 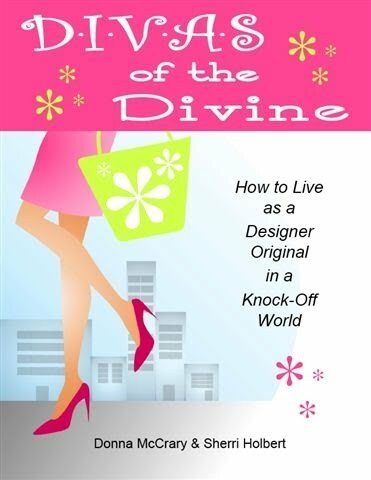 Please enter me in this Diva Contest.